It's that time of year again...Lush Christmas bath products time! The Star dust bath bomb* was included in my goody bag from the Lush Meadowhall VIP re-opening party. I decided to treat myself to a bath on Friday so I grabbed this and chucked it in. I don't recall this one from last year, so I think it may be new for 2015, but I may be wrong (and often am!). This contains fine sea salt, fair trade vanilla absolute, rosewood oil and bergamot oil. There's only a light scent and I would say it's vanilla based. 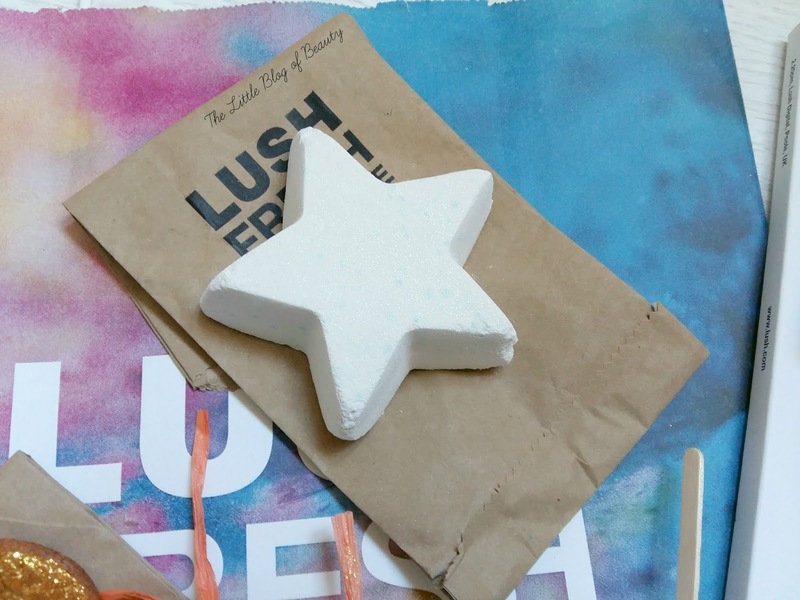 The bath bomb is a plain white star with a subtle gold lustre and although you can't see it in the picture there's also spots of a frosty blue in it. When I dropped this in the bath I thought it would be gone within around 20 seconds, but it did hold out a bit longer than I anticipated, lasting maybe a minute or so. Predictably it starts off with a white foam and some light flashes of blue as the spots dissolve. The lustre also starts spreading out across the water. As it dissolves it then starts to release a little more blue from the middle. Something said to me there was some kind of surprise in the middle and about half to three-quarters of the way through it started releasing little blue, green, red and yellow stars. I was a little concerned what these were made of but they are like a kind of paper that does dissolve. I've just checked the ingredients and they're listed as edible stars so I'm guessing they might be rice paper. This does have a pretty effect as the coloured stars move out across the bath through the white foam. I thought the stars had dissolved away completely while I was in the bath but when I emptied it I discovered they'd all just floated down to sit on the bottom of the tub. When I then rinsed the bath I discovered they were more stuck to the bottom than sat on the bottom. They do stain, but you can remove this with a few scrubs with your finger, or if you have quite high powdered water you can blast them off. When you get out of the bath the lustre does settle on your skin, so it's probably not one for men unless they're going for the Edward Cullen look, but it would be very pretty if you're heading to a Christmas party. Although once you've dried yourself and applied moisturiser some of this is lost. Before I got out of the bath I also found there was a white powdery kind of covering over parts of my skin, so you might want to give yourself a rinse to make sure this is removed. If any of the stars have dissolved on your skin you might also want to remove them as the colouring is quite bright and random bright blobs on your skin is not a good look. I forgot to check my skin before moisturising but as my skin felt pretty good afterwards I would say this does offer some skin conditioning properties from the rosewood and bergamot oil. At £2.95 this is one of the cheaper products in the Christmas range and although it doesn't put on much of a show (apart from the release of multi-coloured stars) I thought it was a lovely bath bomb. I do tend to prefer bubble bars, but I do like some bath bombs if they put on a good show or offer some benefits to my skin, as long as they're not too expensive. I say add this to your Lush Christmas product wish list...we all have one right! Have you tried any products from the Lush Christmas range? This kind of sounds like it's more trouble than it's worth! I do love their other xmas products though. Ooh I think I need to pick this up!